The AXS Port is to use instead of a Mate. You cannot use a Mate and AXS together. Targeting industrial and commercial customers, the SunSpec compliant AXS Port Modbus/TCP Interface provides advanced connectivity with OutBack FLEXmax™ charge controllers as well as other OutBack devices, enabling remote system status monitoring, command and control. 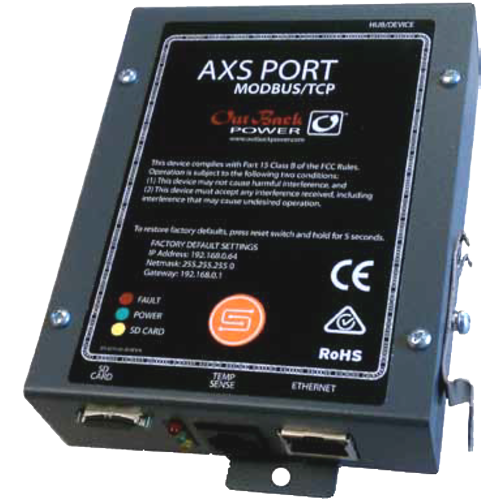 With the AXS Port Interface, users can securely access an OutBack power system anywhere in the world via an Ethernet connection using Modbus Transmission Control Protocol (TCP), and communicate directly to a single device, or to multiple devices using OutBack’s HUB4 or HUB10 communications management components. The AXS Port Interface makes it possible to create custom user interfaces for systems using the advanced API program development kit. System data logs can be downloaded with an AXS Port Interface using Modbus-read or FTP transfer. System operators can adjust system settings or change operating modes, as well as apply future firmware updates to both the AXS Port Interface and other OutBack firmware-upgradable components, either locally or over the Ethernet. All user-configurable values are backed up with non-volatile memory, ensuring stable performance and system recovery. An optional remote temperature sensing function provides a simple, low-cost tool for capturing and reporting ambient temperature or other critical thermal information records. The AXS Port is a SunSpec compliant device, which means it speaks the renewable energy industry’s common language used to drive data and interoperability standards for plug-and-play operation between components and management systems. SunSpec client software is required for operation. For more information visit www.sunspec.org.